Women's Handmade Silver Bangle : LOVE2HAVE in the UK! A handmade women's bangle made of solid sterling silver. This sterling silver bangle features the same exquisitely handmade textured surface that also features on our gold and silver wedding rings on our website from the same collection. The texturing is similar to that of the surface of sand or even dust. The subtly pitted texture looks like sand or dust sprinkled onto the silver. 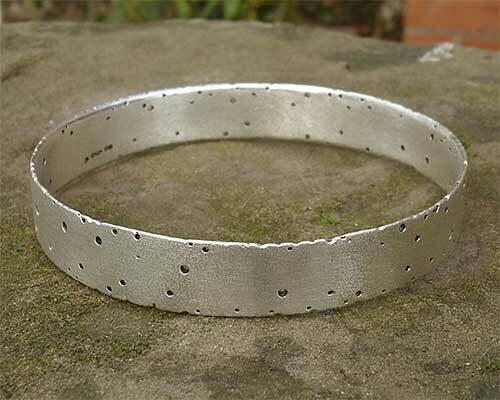 The bangle also features small drilled holes which add to its designer styling. 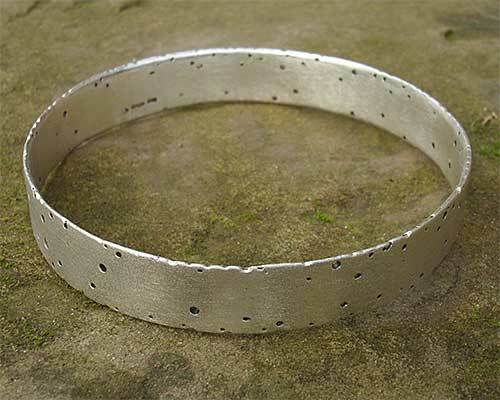 Both sides of the bangle have random cut outs with wobbly edges, and for that added designer touch small random holes have been cut through the surface itself for added dimension. The width is 10mm, and it has an inner diameter of 70mm, perfect for fitting over most women's wrists. Size(s) Available: 70mm as standard.